The Affenpinscher is bold, alert and curious. He loves to play with his toys and play games with people. He loves his family and craves love and attention. He doesn't realize that he's a small dog. He's fearless and won't back down if confronted. He can be hostile around other dogs, which means he might provoke an attack that could end in an injury, either to himself or to another dog. So you have to keep an eye on him and stop him from picking fights. Because of this characteristic, some people call him a "Rottweiler wannabe". He loves his master and his family and shows great loyalty to them. Training him is quite easy as he is a fast learner. Some Affens are difficult to housebreak. He shows his affection by greeting you with hugs and kisses when you arrive home. He makes a keen watchdog and will alert you to a stranger at the door. He is generally cautious around strangers who approach him, and becomes more comfortable with them as he gets to know them. He gets along well with other pets and dogs in the home, especially if he was raised with them. He sheds very lightly; you'll be hard-pressed to find a hair in your home, which makes him a good choice if you're a clean freak. The Affenpinscher is 9 to 11 inches tall (to shoulders) and weighs 7 to 9 pounds. He has a medium-length wiry coat which can be black, black and tan, gray, silver, beige, or red. You only need to brush his coat every few weeks. Pet coat: Clipped short every few months. Show coat: Dead hairs are plucked-out every six months. The Affenpinscher is one of the most ancient toy dogs. He originated in central Europe during the 17th century from small terriers who were kept on farms and in homes to kill rats and mice. The breeding of Affenpinscher-like dogs in Munich, Germany eventually became what we now know as the "Affenpinscher" today. 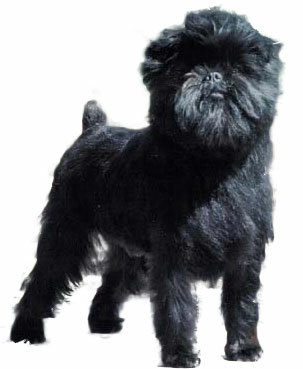 The Affenpinscher is thought to be a parent - used in the development - of the Brussels Griffon and Miniature Schnauzer breeds. The breed was recognized by the AKC in 1936. His AKC popularity was 125th out of 157 breeds in 2007.